Explore historic towns, hike through picturesque parks or unwind at beaches and hot springs in this beautiful region surrounding Italy’s largest lake. Lake Garda is one of Italy’s most popular vacation destinations, known for its stunning natural scenery and rich culture. The lake’s northern area attracts outdoor enthusiasts eager to windsurf or explore its rugged terrain. The south draws visitors with its laid-back resorts, pleasant beaches, scenic vineyards and pretty villages. As a result of the lake’s size and local wind patterns, temperatures here are milder and sunnier compared to the rest of the region. You’ll notice the landscape is dotted with citrus orchards, vineyards and olive groves, all of which give the lake a distinctive Mediterranean feeling. Visit the lake’s northernmost town, Riva del Garda, to enjoy some of the best windsurfing conditions in Europe. Go for a stroll along the lake to people-watch and check out experienced windsurfers in action. In Sirmione, soak in the natural hot springs, which have made this town a popular vacation destination since Roman times. Savor a creamy gelato while wandering along cobblestone streets, enjoying its old-world atmosphere. Be sure to visit Grotte di Catullo, one of Northern Italy’s best-preserved Roman residences. The crumbling stone arches and walls are spread across terraced hillsides and surrounded by cypress and olive trees. Enjoy beautiful views across the lake or take a look inside the accompanying museum of Roman artifacts. Step into the eccentric world of 19th-century writer Gabriele d'Annunzio at Il Vittoriale degli Italiani. Despite being acclaimed as one of Italy’s greatest writers, d’Annunzio left a controversial legacy for his Fascist political views and wild lifestyle. Check out his flamboyant residence, which is decorated with leopard skins and black velvet drapes. Cycle or walk through the picturesque evergreen forests and orchid meadows of Parco Archeologico Rocca di Manerba. A UNESCO protected site, this reserve is home to some of the lake’s best beaches for soaking up the sun or swimming. Lake Garda is located midway between Milan and Venice, and can be reached by train. To avoid crowds, visit outside of the popular summer season when there are many festivals and events. These include the Il Festival del Garda, with music competitions and beauty pageants, and the boat races between teams from around the lake. 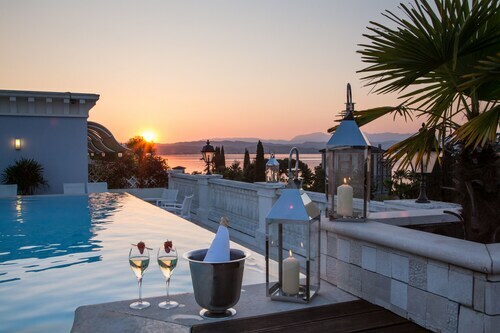 Situated on a lake, this hotel is 2.8 mi (4.5 km) from Desenzano Castle and 2.9 mi (4.6 km) from Scaliger Castle. Center Aquaria Spa and Wellness Center and Grotto of Catullus are also within 6 mi (10 km). 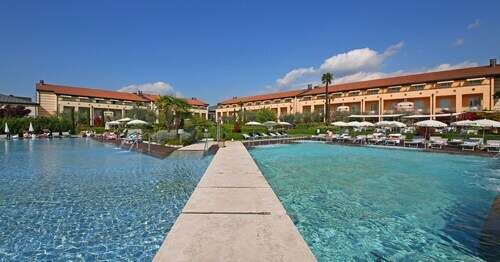 Situated in Bardolino, this spa hotel is within a 10-minute walk of Church of San Nicolo and San Severo, Monumento ai Marinai, and Church of San Severo. Guerrieri Rizzardi Winery and Cantina F.lli Zeni Wine Museum are also within 1 mi (2 km). 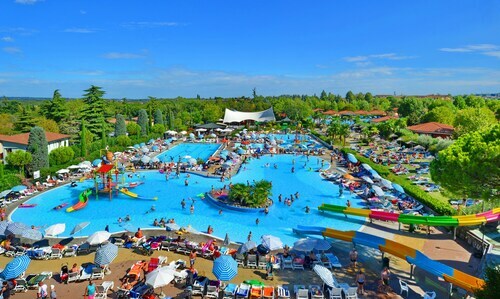 This family-friendly Peschiera del Garda campground is located on a lake, within 2 mi (3 km) of Zenato Winery and Sanctuary of Madonna del Frassino. Clinica Pederzoli and Fort Ardietti are also within 3 mi (5 km). This family-friendly Castelnuovo del Garda hotel is within 1 mi (2 km) of Sea Life Aquarium and Gardaland. Villa Dei Cedri and Movieland are also within 3 mi (5 km). 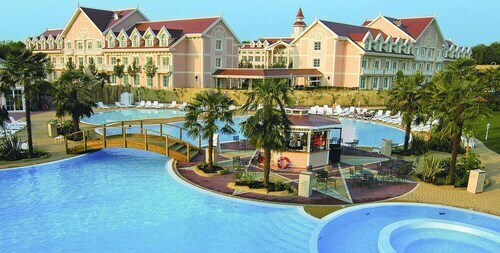 This family-friendly Lazise hotel is located on a lake, within 1 mi (2 km) of Gardaland and Movieland. Canevaworld - Aqua Paradise and Parco Natura Viva are also within 6 mi (10 km). Situated in Bardolino, this spa hotel is within a 15-minute walk of Church of San Severo, Church of San Nicolo and San Severo, and Monumento ai Marinai. Guerrieri Rizzardi Winery and Cantina F.lli Zeni Wine Museum are also within 2 mi (3 km). 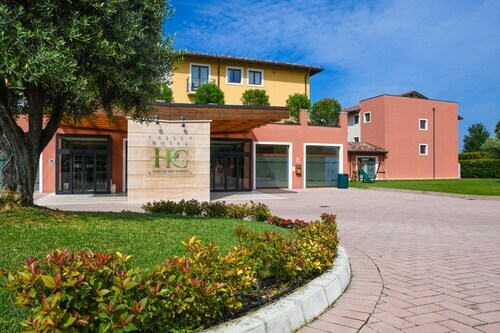 This family-friendly Bardolino hotel is located near the beach, within 1 mi (2 km) of Museum of Olive Oil, Cantina F.lli Zeni Wine Museum, and Valetti Winery. Church of San Nicolo and San Severo and Guerrieri Rizzardi Winery are also within 2 mi (3 km).